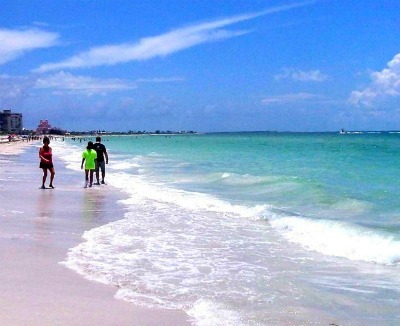 St. Pete Beach near Tampa is regarded as one of the best beaches in the United States. It’s located on a barrier island named Long Key, along with 7 other islands and has almost brilliant white sand and the gentle waves of the Gulf of Mexico. Many people get confused thinking of Saint Petersburg, Florida, which is a huge city to the east on Tampa Bay. But St. Pete Beach was formed when in 1994 locals decided to call the area what everyone was calling it anyway – they renamed the place. It’s formed of Pass-a-Grille, Don CeSar (two beach towns along the same strip), Belle Vista, and some unincorporated land. What makes this area so great is the weather and the beach; both amazing. There are beautiful dolphin which play right near shore and the views can’t get better. If you’re into hotels near the beach, there are several great resorts and smaller hotels that line the ocean. And relaxing can’t get easier. Great sea-side bars make St. Pete Beach so laid back and sweet. From PCI Bar, Jimmy B’s (we love this one! ), Sloppy Pelican, Daiquiri Shack, Woody’s Waterfront and more – all with live entertainment. Historic Corey Avenue runs right through town and along the beach and has many restaurants and shops that will keep you busy when you’re not sifting that white, powdery sand through your toes. There are many waterfront eateries along with some amazing places where you might want to simply get a drink, take in the view and then go dine elsewhere. It’s all simple here in St. Pete Beach. There is a nice playground beach-side for kids, along with great concessions when you get a little hungry but don’t want to call it a day in the sand. There are picnic areas along with full facilities and showers. This is a great family beach and set for people who want to relax and watch the sunset. St. Pete Beach was named the number 1 beach in the United States by users of the super popular website, “Trip Advisor” for 2012. This area is so special because it starts out just north of the Don CeSar Hotel and then comes northward along Gulf Boulevard still lined with old and new resorts, those old Florida style motels, restaurants, small grocery stores. We thought the area had a very nice “retro” look to it and people just eat that up here. It’s a great mix of old and new. You’ll still find all the fast food joints, diners and restaurants you’re familiar with, but keep an eye out for The Wharf, and Sea Critters which is fun for the family – especially after dusk when they light their under dock lights and let kids feed the fish. Both of these are located in nearby Pass-A-Grille. This barrier island is thin and you’re never too far from the ocean – either the Intracoastal Waterway or the Gulf Coast. Near the north end of the island you’ll see more surf shops – because here on the beach is one of the few place on the Gulf you can actually surf.